Being a pug lover, I had to read The Juggling Pug. In the book, written for children ages three to six, a talented pug learns to juggle. He and his town become famous. But pug is naughty, destroying homes, digging on floors, and pooping on carpet. Since kids get such a kick out of laughing at bodily functions, I’m sure that will amuse young readers! One day, a girl lost her patience and declared to the town that no matter how good he was for the town, they should get rid of him because he is so troublesome. Pug begged forgiveness and promised to change his ways, but he can’t resist pooping on his friend Doug’s carpet. The illustrations are great, and it would be fun to discuss with a young reader how many different things pug juggles. I am conflicted about the story itself. It seems draconian to expel pug without some coaching. 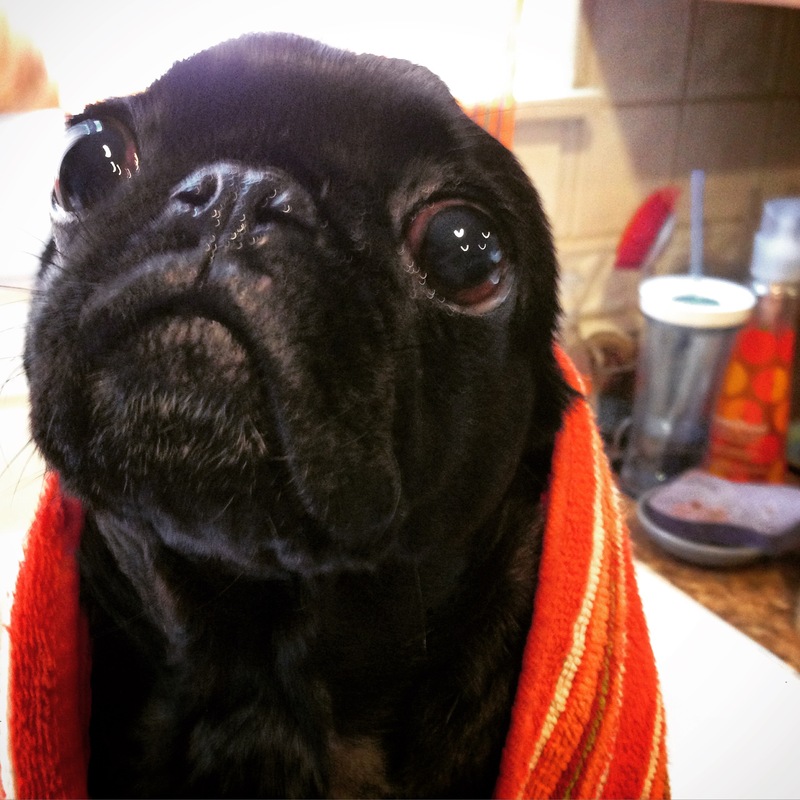 Then when pug gets a reprieve, his promises are false and he doesn’t even try to be more well-behaved. Insofar as a kid is exposed to the book without any critical analysis, they may come away internalizing some poor messages. However, if the reader uses the story as a teaching moment, then the book can be a springboard for discussing respect for others and their property as well as consequences of bad behavior. BOOK REVIEW: Pug Meets Pig, a book about new friends and change, plus pugs and pigs! Pug loves his house and he loves his routine; everything is just right. He sleeps in his comfortable house, goes to “work” barking at the neighbors and digging holes, and eating from his personalized food bowl. That is, everything is just right until Pig arrives. Pig ruins everything. She shares his bed, eats from his bowl, and makes friends with the neighbors. But Pug learns that having a friend might not be so bad. With adorable illustrations, Pug Meets Pig sends the message that change is not always bad and that friends can make even everyday activities more fun. Recommended for children ages four to eight, this book will be sure to delight them with it’s fun repetition and silly characters. Pug lovers, too, need this in their libraries. Pug’s expression are priceless and really capture pugs’ personalities. Be sure to check out the sequel, Pug and Pig Trick-or-Treat. I hope that Gallion and Wan produce more Pug & Pig books! After the mission to kill Osama bin Laden was made public, neuroscientist Gregory Berns thought about Cairo, the dog who rappelled with his handler from a helicopter into the desert compound in Pakistan. If a dog could be trained in that context, surely Berns could train dogs to enter an MRI machine for a scan. The Dog Project was born. Starting with his dog Callie and using a mock MRI tube and coils, he began training dogs. The dogs were not sedated or restrained and were given the respect according to human subjects–the right to refuse, which some did. Working with Peter Cook and other colleagues, Berns developed innovative and well-designed studies that revealed aspects of the dog’s brain structure and provided insight into their mental processes. Investigating self-control, preferences, and even emotion recognition, over and over, Berns discovered that humans and dogs shared the same brain structures and that they functioned in the same way. Berns’ interest in dog neuroscience extended to other animals as well. He scanned the brains of sea lions, dolphins, and Tasmanian devils and the extinct Tasmanian Tiger (thylacine). The results Berns shares here provide insight not just into dog neurology, consciousness, and behavior, but into other animals as well, including human animals. We are much more similar than different, and, as Berns anticipated, the “inevitable” result of the studies is a necessary questioning of how we use and abuse animals and their habitats. I loved What It’s Like to Be a Dog, thought I have to admit that this book appeals to my interests as a dog guardian, animal lover, and animal rights supporter. Even if you do not fall into all or even one of these categories, the book is worth reading. While I thought this might be a rather light-hearted summary of Bern’s research, I was proven wrong. I learned so much about brain structure and function across species. Though the concepts are complicated, Berns writes in an engaging and straightforward manner that make the scientific descriptions easy to follow. Berns summarizes his own research which is innovative and well-designed, and the book itself is well-researched, drawing on the most recent studies. While Berns is excellent recounting the science, he is at his best when describing the dogs who participated in the research. His love for them is clear, and there’s nothing I love more than someone who loves dogs. Berns’ concludes that research has not yet show that animals are self-aware, but there is no question they are sentient, and he criticizes how we approach animals as property. His analysis only supports my personal beliefs, but this may be controversial for some readers who have a utilitarian approach to the use of animals in research and food production. Although this is definitely a science book, it is completely relatable, and more than once, I was brought to tears. A description of the last Tasmanian Tiger’s final days in an Australian zoo absolutely gutted me, and I had to skip a few paragraph when Berns recounts his experience at his medical school’s dog lab. The book is illustrated with photographs of the MRI dogs in action as well as some of the brain scans, the former adorable and the latter intriguing. I did wish that there had been an diagram showing the regions of the brain since Berns often referred to different areas. With the title and cover image, I was primed for a book on dogs, so I was surprised to read about sea lions and marsupials, but I welcomed the perspective these studies provided. Whether you love dogs, enjoy reading about cutting-edge science, or are an animal rights advocate, you should read What It’s Like to Be a Dog. You will learn as much about your own brain as about those of our animal relatives. Thank you to Netgalley and Basic Books for an advance reading copy in exchange for an honest review. #WeRateDogs compiles the greatest hits of Matt Nelson’s popular Twitter feed. Nelson rates the dogs (and a couple of other animals, a horse for example) in user-submitted photographs (never lower than 10/10 or 11/10) and writes hilarious captions to go with them. One caption for a yellow lab reads, “Say hello to Winnie. She accidentally opened the front-facing camera, but then realized she’s flawless and proceeded to take more pictures. 13/10 confident af,” (p. 146). I also love the captions that chastise people for sending “non-dog” photos. “Okay, how did our editor not catch this? We rate dogs, not Yugoslavian Snow Ostriches. Unbelievable. Please be more careful with your submissions next time… 11/10 would still pet,” (p. 16). Of course, there is no such thing as a Yugoslavian Snow Ostrich—the picture is a dog with his head in a hole in a snow-covered yard. The book is heart-warming and fun. I highly recommend it. While you’re at it, follow #weratedogs on Twitter and Instagram!